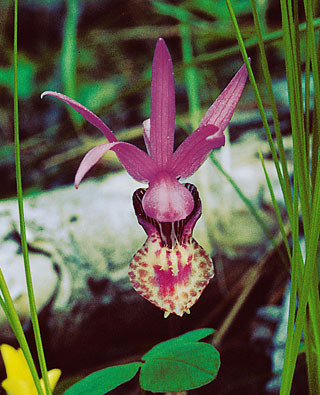 also called Fairy Slipper or Deer’s Head Orchid. Flower single, pink, irregular; lip (lower petal) slipper-shaped, almost white, magenta-spotted above, magenta-streaked beneath; other 2 petals and 3 sepals all much alike, narrow, ¾” long [2 cm]; leaf single, basal, broadly oval, growing in fall, withering by early summer; stem 3–7″ tall [75–175 cm]. Natural History: A close look reveals these little orchids to be just as voluptuously overdesigned as their corsage cousins, which evolved bigger to seduce the oversized tropical cousins of our insects. Get down onto their level to see and smell them, using a hand-lens if you like, but don’t pick them. Their bulblike “corm” is so shallowly planted that it’s almost impossible to pick them without ripping the corm’s lifelines. A calypso is utterly dependent on a symbiotic relationship fungal and plant hosts that provide most of its nutrients; its single leaf withers and is gone early in the growing season. Like other orchids, it produces huge numbers of minute seeds (3,770,000 seeds were found in one tropical orchid’s pod) with virtually no built-in food supply, and an abysmal germination rate. They germinate only if particular species of fungi are already growing there and ready to form mycorrhizal connections that will serve in lieu of root hairs. The black specks filling vanilla beans and some vanilla ice creams are familiar examples of orchid seeds. This article and photo are adapted from Northwest Mountain Wildflowers, an app for iPhone and iPod.